Leash aggression is a common behavioral problem where dogs tend to become more aggressive when leashed. The absence of proper training and lack of socialization are typically pegged as the primary causes of leash aggression, though a new study has uncovered another possible cause for it: hormones. Specifically, the hormones oxytocin and vasopressin, which are becoming increasingly known as the “yin and yang” hormones due to their impact on social behavior. Led by Evan McLean, director of the Arizona Canine Cognition Center in the University of Arizona School of Anthropology, the team recruited pet dogs whose owners claimed to have issues with leash aggression. The participant dogs were of varying breeds, ages, and sexes, as were the non-aggressive dogs who acted as their comparisons. Each dog was leashed alongside its owner during the experiment. Behind a curtain on the other side of the room, a researcher played a recording of dog barks before pulling the curtain back to unveil a realistic dog model and a human handler. The team did the same with everyday noises and a cardboard box, an inflated yoga ball, and a trash bag — common objects that the dogs were often exposed to. Each of the dogs’ responses and hormone levels were evaluated prior to and following the experiment. None of the participant dogs displayed any hostile responses towards the common objects. 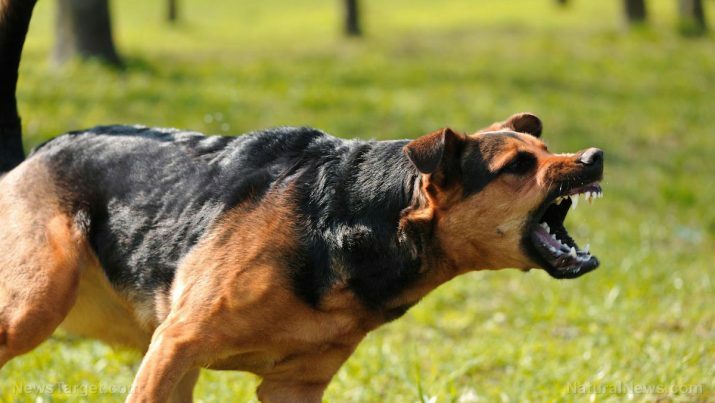 However, many of the dogs belonging to the leash aggression group showed belligerent reactions to the model dog, with some barking, growling, and lunging at the model. These dogs were found to have greater levels of total vasopressin in their systems. Conversely, the researchers noted no discernible differences between the oxytocin levels of the two dog groups. When compared against a group of assistance dogs, the team discovered higher oxytocin levels and larger oxytocin-to-vasopressin ratios. Based on their findings, the researchers concluded that there was indeed a link connecting vasopressin to aggression, and that oxytocin plays a role in suppressing aggression. The varying hormonal levels among dogs could in part be attributed to life experience. In addition to this, diet may also contribute to the balance of hormone levels. This is certainly the case with humans, as a limited diet filled with junk foods has been shown to throw our hormone levels off-kilter, while consuming a varied and well-balanced diet leads to excellent health inside and out. After all, hormones are the body’s chemical messengers, and an unwell body equals chemical messengers that are unable to do their jobs properly. Feeding them fresh whole foods – Shelf-stable foods should never comprise the entirety of a dog’s daily meals. These types of foods are usually loaded with synthetic supplementation that could never hold a candle to the nutrition provided by fresh vegetables, fruits, and meats. The nutritional abundance and diversity aside, whole foods have substances in them that help dogs’ bodies absorb and make the most of the nutrients they provide. Avoid cooking meats all the way through – If you’re the sort who likes to cook meat for your dog, it’s best for you to lightly sear it instead of baking, frying, grilling, barbecuing it. Raw meat is packed with nutrients that become lost once exposed to high temperatures. In some cases, heating up meat can even bring about the formation of cancer-causing compounds. Limiting treats and never overfeeding them – Doing this can cause dogs to gain weight and may even set them up for obesity later in life. Dogs will naturally gain weight as they age, so don’t allow them to pack on the pounds early on. To stay updated on all dog-related news, visit PetHealth.news today.